To study social facilitation and social inhibition, Hazel Markus (1978) gave research participants both an easy task (putting on and tying their shoes) and an unfamiliar and thus more difficult task (putting on and tying a lab coat that tied in the back). The research participants were asked to perform both tasks in one of three social situations: (a) alone, (b) with a confederate present who was watching them, or (c) with a confederate present who sat in the corner of the room repairing a piece of equipment without watching. As you can see in Figure 10.4, “Group Task Performance,” Markus found first that the difficult task was performed more slowly overall. But she also found an interaction effect, where the participants performed the easy task faster but the more difficult task slower when a confederate was present in the room. Furthermore, it did not matter whether the other person was paying attention to the performance or whether the other person just happened to be in the room working on another task—the mere presence of another person nearby influenced performance. These results convincingly demonstrated that working around others could either help or hinder performance. But why would this be? One explanation of the influence of others on task performance was proposed by Robert Zajonc (1965). 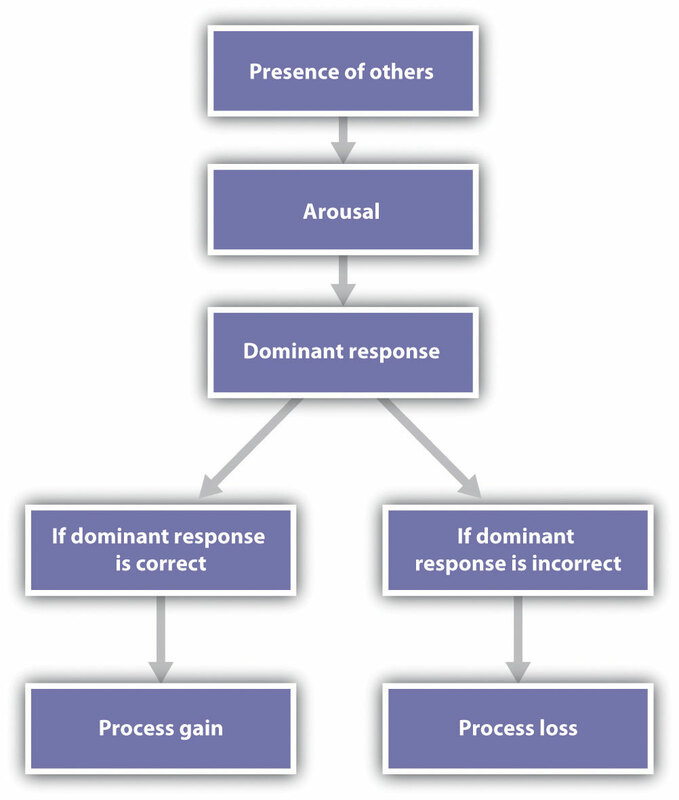 As shown in Figure 10.5, “Explaining Social Facilitation and Social Inhibition,” Zajonc made use of the affective component of arousal in his explanation. Zajonc argued that when we are with others, we experience more arousal than we do when we are alone, and that this arousal increases the likelihood that we will perform the dominant response—the action that we are most likely to emit in any given situation. In a seminal study of group effects on individual performance, Ringelmann (1913; reported in Kravitz & Martin, 1986) investigated the ability of individuals to reach their full potential when working together on tasks. Ringelmann had individual men and groups of various numbers of men pull as hard as they could on ropes while he measured the maximum amount that they were able to pull. Because rope pulling is an additive task, the total amount that could be pulled by the group should be the sum of the contributions of the individuals. However, as shown in Figure 10.7, “The Ringelmann Effect,” although Ringelmann did find that adding individuals to the group increased the overall amount of pulling on the rope (the groups were better than any one individual), he also found a substantial process loss. In fact, the loss was so large that groups of three men pulled at only 85% of their expected capability, whereas groups of eight pulled at only 37% of their expected capability. The results of the experiment are presented in Figure 10.8, which shows the amount of sound produced per person. The top line represents the potential productivity of the group, which was calculated as the sum of the sound produced by the individuals as they performed alone. The middle line represents the performance of hypothetical groups, computed by summing the sound in the conditions in which the participants thought that they were shouting in a group of either two or six individuals, but where they were actually performing alone. Finally, the bottom line represents the performance of real two-person and six-person groups who were actually shouting together.